A Life of Sugar and Spice: So what am I eating now? I'm still making the transition to a cleaner diet and have had a few slips here and there, for example Enjoy Life Foods sent me some cookies to review so of course I have to eat them! For the most part though, the transition is going smoothly and I'm feeling great. I've even lost a few pounds, but I'm keeping the number a secret since some of my co-workers read this blog and I don't want them to know how well I'm doing in the Biggest Loser competition. I'm not going to keep referring to it as Paleo because as I continue to research that specific diet, I've come across a lot of inconsistencies. Folks that are truly Paleo don't eat things like potatoes and squash but I'm not going that far. I don't actually want to lose a ton of weight and cutting out starchy veggies would definitely put me in the sickly category. sometimes some cape cod chips.... I know.. I know. It's a transition!! I've also eaten a chicken curry dish, beef stew, burgers wrapped in lettuce, lots of good stuff! I plan to make a chicken stir fry tomorrow. I am really feeling great on this cleaner, MUCH less processed diet. My stomach is feeling awesome and my skin is getting better. I don't need to eat as often as I used to, I've basically eliminated snacks between meals. I'm alert, strong and happy. I love this! Sometimes I do get a pang of sadness when I think about a piece of toast with my eggs or a gf cupcake, but truthfully, I don't have sugar cravings at all and I really don't crave bread or pasta. My body is getting exactly what it wants and needs so it's happy! I actually ate gf pancakes over the weekend and the syrup made me very sick. I know it was the sugar because I've had that reaction before, it was just way worse after NOT eating any sugar for two weeks. I encourage any of you that are considering cutting out grains altogether to just do it! It feels great. Don't let the naysayers get you down, you really don't need grains to be healthy. In fact, they kinda weigh you down. I really do think that "all roads lead to paleo." I so need to do this and cut out sugar and processed food. Very inspiring post. I REALLY appreciate the details about what you ate that day. That is incredibly helpful to someone who wants to change their diet. 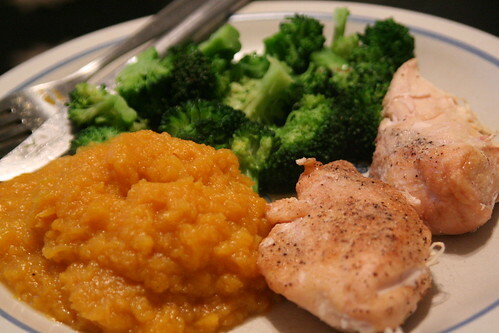 Seeing exactly what a healthy, paleo-ish diet is a huge help. Looking forward to hearing more.